Four beetles were among the wealth of wildlife uncovered in a survey of the garden at John Lennon's childhood home. The National Trust, which owns the house known as Mendips in Woolton, Liverpool, carried out the survey on the 100ft-long (30m) garden. A wasp beetle, which mimics wasps, three species of ladybird, as well as wildflowers, frogs and wood mouse were among the discoveries. 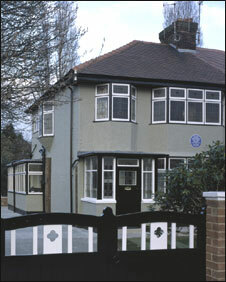 Lennon lived at the house from the age of five to 23. Ecologist Peter Brash, who carried out the survey, said: "This wildlife survey at Mendips uncovered a garden which has been undisturbed for years with lots of nearby green spaces including Strawberry Fields, creating ideal corridors for wildlife. 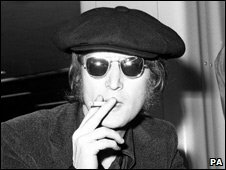 "We can only speculate on the wildlife that would have occupied the garden in the 1950s when John Lennon lived with his aunt and uncle. "But it's clear from the lush green surroundings of the Woolton area of Liverpool that bird song and butterflies would have been an everyday part of his life." The survey team turned up wildflowers including lesser trefoil and common cat's ear in the lawn, which Lennon used to mow to get his five shillings pocket money. Birds seen or heard in the garden included wrens, swifts, goldfinches, swallows, housemartins and dunnock. The Trust's biological survey team examined the wildlife in the garden of Mendips as part of its work surveying species and habitats of National Trust properties. Early Beatles songs were written at Mendips. The three-bedroom semi-detached house was bought by Yoko Ono in 2002 and donated to the National Trust. The Trust restored it to how it would have looked when it was Lennon's home and opened it to the public in 2003.